I rarely fish any Iowa lakes. There is the old axiom of the 50 mile expert is the one you should always contact for ideas and to give direction and meaning to what you need to do. I hate to admit it but I have traveled over 300+ miles only to get skunked. After all it is called fishing not catching. The same saying applies to hunting. That is why it is called hunting not shooting. This has been the summer for trying out new ideas and visiting new places. Results have been acceptable considering you are just getting the feel of the place initially. 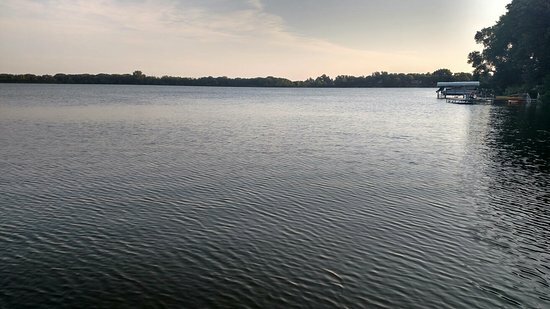 Every week the state of Iowa puts out a fishing report on lakes in the different areas of the state. As a boy, I fished one of the lakes in the region and the results were very good, but that was 60+years ago. 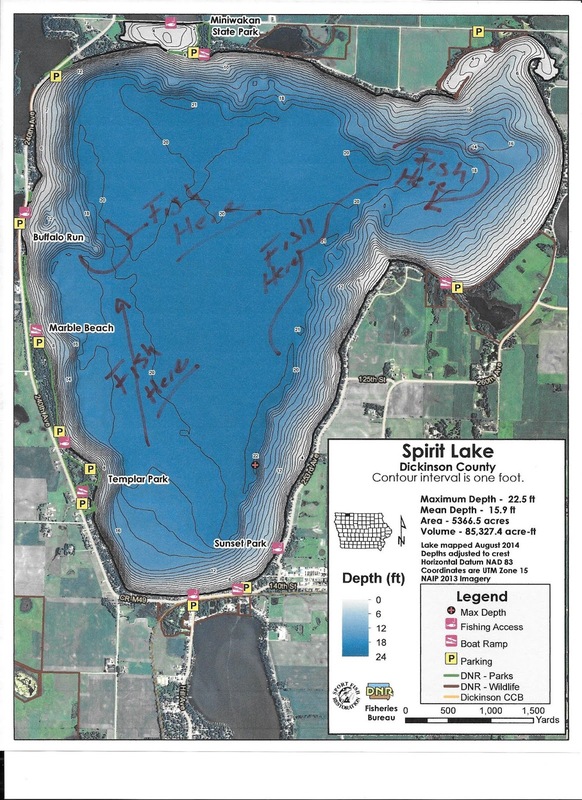 This year I noticed that Spirit Lake in the Great Lakes Region of Northwest Iowa was getting good results for walleye catches and good catches of other fish. After scoping the internet, I just didn’t have the feel I was getting good information about Big Spirit Lake. With that in mind, I said to my wife Pam,”It is only a little over 3 hours up there, so let’s go up and check the area out.” In this fashion, we will find places to stay that cater to fishermen and women. We like to eat well and at our age, you never know if this will be your last chance at a great meal. So we check out all the places that will give us the opportunity to dine well. The two most important items are the boat ramps and the fish cleaning stations. We have put our boat into some places that I thought, good grief, how am I going to get this thing out? An 18.5 foot Crestliner is not light, and I have one too many scratches and bumps on this boat. To learn about the town of Spirit Lake, Iowa go to their website. The first motel we spotted was the Northland Inn, just as we entered the town. The motel had what we expected, but we needed to check out the rest of the facilities in the town. Super 8, Ramada, and a couple of private motels were available, but we went back to the Northland to meet the owner. This lady was a peach and a plethora of information. Yes, our catch of fish could be frozen at the motel. Yes, they have an area to clean fish. The next thing she said was, “Would you like to see a room?” “Of course,” was our answer, and the room was perfect for us and really neat and clean. I have to admit, that I have taken my wife to some places that I was not pleased with in South Dakota, but this room was excellent. This is a resort area with Arnold’s Park and Lake Okoboji and the lady had many suggestions of basic to fine dining. We now had our place to stay. A place to clean and freeze fish. She suggested just to drop the boat on the grass in the front of the motel. We could use our truck to get around and not have the problem of parking a trailer in a tight parking area of the eating establishments. Next we scouted out a couple of bait stores and took a drive around the lake. The people at the bait stores were very informative as they always are. They want us to catch fish and buy bait. This lake is really big and based on the reports, is an excellent fishery. We scouted it out in its entirety. 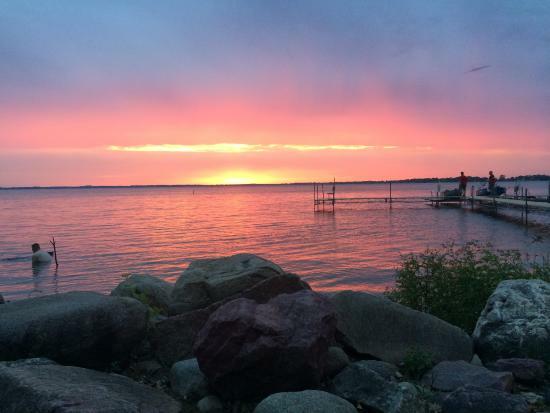 The lake is almost entirely surrounded by private housing and many of the areas are private. Therefore, you cannot enter by car to check out the banks. No need to do that as there are some excellent maps which the state of Iowa has supplied to obtain information about the lake. At the south end of the lake is a state fish hatchery. We did not stop to visit, but the next time up we will make it a must item on our list. Walleye is stocked into the lake. The boat ramp and parking area is excellent and totally out of the wind. That is nice as I like to get my boat on straight. We did not find one fish cleaning station, however the motel will supply that item. There are two things that concern us right now. We think the lake is heavily fished and we might not have great success just due to the pressure. There is a slot. You must throw back live all walleye caught that are between 17 and 22 inches. The daily limit is 3 per license, and you can keep one fish over 22 inches. I will take all the sixteen inch fish I can catch, and if I caught one 22 inches long, that would be a bonus. Their requirements on the lake tell me the state is going to manage this fine fishery to give everyone good fishing. The lake also has a good mix of other very eatable fish. Perch, small mouth bass, and northern are also in the lake. For a bonus you have the fish of 1000 casts, the musky. We will take all the northern pike that are of decent size and filleted out with the Y bones removed. They are excellent eating. If we get a good break in the weather, and Pam and I will take a trip and try it out. This is the entrance to the boat ramp and if you go straight ahead you will be on private property. Don’t do that. Good ramp and out of the wind. Ample parking behind me. Here is the slot for walleyes. Look at that musky requirement. I want to catch a 40 inch musky just once. I marked on the map areas recommended by the bait shop to hammer the big fish. I did not mark the east side north of the bay and there is a stand of cabbage weed. That probably is a good place for the fish of 1000 casts, the Musky. I am sure there are plenty of northern pike in the cabbage weed. Click on this link to buy Hank’s book.